“In the land-grant system, communities inform research as much as research informs the community. “Instead of simply being experts prescribing solutions to peoples’ problems, scientists and scholars at Cornell work in collaboration with anyone, from farmers and business owners to policymakers and schoolchildren, Peters said. They play important civic roles, sometimes even engaging in “shuttle diplomacy” as they help opposing factions work together on public issues and problems. Vinay Pagay won the award for best student oral presentation in viticulture. Martin Goffinet was a special invited speaker giving the first in a series of “master classes” for research and teaching. His review of grapevine anatomy, morphology and development was attended by more than 250 attendees who stayed for nearly three hours. A true “tour de force” that astounded many with the depth of Martin’s knowledge and the relevance to so many environmental and cultural issues in viticulture. Our students have been fortunate to have received this level of understanding in his section of the grapevine biology class. The NYS IPM Program is excited to announce 3 professional job openings. These appointments are for 6-9 months. However, there is potential for extension into long term positions. A Masters or PhD degree in entomology, plant pathology, horticulture, natural resources or a closely related field is required. These positions are being announced in June 2012, and will be filled as soon as suitable candidates are found. If interested in multiple positions, please indicate in the cover letter. Follow links above for more information about each position. Lindsay Jordan, M.S. 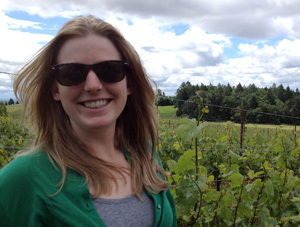 candidate in the Graduate Field of Horticulture, has won the prestigious 2012-2013 Michael Vail scholarship from the American Society for Enology and Viticulture (ASEV), an American Wine Society Educational Foundation scholarship, and an ASEV Eastern Section scholarship. Jordan’s research is examining the use annual cover crops in Finger Lakes vineyards to reduce vine vigor and improve Riesling wine quality. Other Cornell students receiving 2012-2013 ASEV scholarships: Amanda Sims (Horticulture, Lakso Lab), Paola Leonor Barba Burgos (Plant Breeding, Reisch Lab), Charles Frohman (Food Science and Technology, Mira Lab) and Melissa Aellen (undergraduate, Viticulture and Enology). Undergraduates can now add a passion for plants to their Cornell credentials by minoring in horticulture. The Minor Program of Study in Horticulture aims to increase students’ knowledge and skills for managing fruits, vegetables and landscape plants for the purpose of improving the quality of life for individuals and communities. A minor in horticulture can complement many areas of study, from art history to biological engineering to hotel management. Plus a minimum of eight additional credits at the 2000-level and up, for a minimum requirement of 15 credits in horticulture coursework. Special topic courses, seminar courses, and courses without regular instruction cannot be counted toward the credit requirement without prior written approval of the program advisor. All courses must be taken for a letter grade, and a grade of “C” or better must be received to count toward the minor. 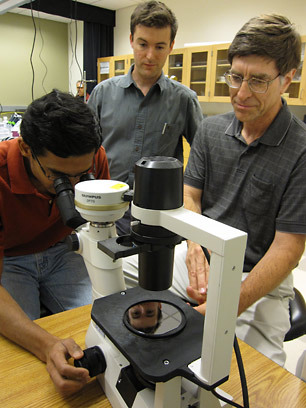 Any undergraduate student, except those majoring in Plant Sciences, may enroll in the minor. Transfer students are encouraged to apply for a minor in horticulture. Interested students should visit the Minor in Horticulture webpage for more details, instructions and an application form. 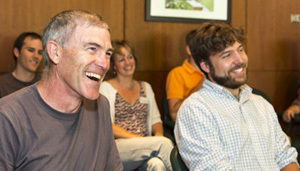 Steve McKay, farm manager, left, and Glenn Evans, director of operations at the Cornell University Agricultural Experiment Station. Dave Burbank photo. From Cornell Chronicle article 6/14/2012. Steve McKay, farm manager at the Homer C. Thompson Vegetable Research Farm in Freeville, has been chosen as the 178th recipient of the George Peter Award for Dedicated Service. McKay’s supervisor, Glenn Evans, director of operations for the Cornell University Agricultural Experiment Station (CUAES), in his nomination letter wrote of McKay’s “outstanding ability to collaborate with faculty, field assistants, students, research technicians and the administration” of the CUAES, noting especially his work with local food banks, service on the CUAES Sustainability Action team and “exceptional day-in and day-out service and support” to faculty. “He constantly makes suggestions to individuals, departments and college leadership about ways to improve the status quo. … I doubt there is a single faculty person or graduate student who would not give Steve their highest marks for professionalism and support,” wrote Marvin Pritts, chair of the Department of Horticulture, in his nomination letter. The longest running and most prestigious universitywide, peer-nominated award, the George Peter Award for Dedicated Service is given by the Employee Assembly to staff members who consistently demonstrate a high degree of excellence in doing their jobs and who extend themselves to help others and go above and beyond the normal expectations of their job responsibilities. Armyworms arrive – Walt Nelson, Cornell Cooperative Extension, Monroe County, is featured in this WHAM Channel 13 Rochester news story. Expect slim pickings for apples and peaches [Syracuse Post-Standard 6/5/2012] – Deborah Breth, a fruit specialist with Cornell Cooperative Extension for 27 years ago, said crops are in the worst shape she’s seen since she began her job. Planning and Organizing Sustainable Gardening Programs – Starts Sept. 4. Looking to start a school or community-based garden program, but do not know where to begin? This course focuses on the foundations and benefits of garden-based learning, and provides the tools, resources, and collaborative support needed to plan, organize and develop a successful and sustainable gardening program that fits your organization’s needs. Teaching and Learning in the School Garden – Starts Oct. 8. Focusing on the foundations, benefits, and teaching strategies of garden-based learning (GBL), participants will build a toolbox of resources for developing a school gardening program that meets cross-curricular needs. Case study, research, and GBL resources are evaluated through group discussion, learning activities, and reflective journals. Educational theory will be put into practice using real-world tools, through collaboration, practicum, small and whole group discussion, lesson plan assignments, and the final portfolio project. For each of these course, participants who receive a cumulative outstanding or satisfactory grade Cornell University will award 3 Continuing Education Units and a certificate. Find out more about these and other distance learning courses offered by the Department of Horticulture. 67-page guide is targeted for commercial growers and available free online. 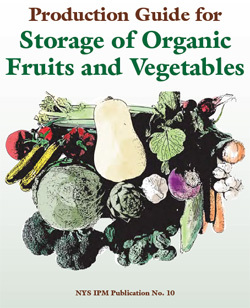 Other titles in the NYS IPM Program series include organic production guides for apples, blueberries, grapes, strawberries, beans, carrots, cole crops, cucumbers and squash, lettuce, peas, potatoes and spinach . 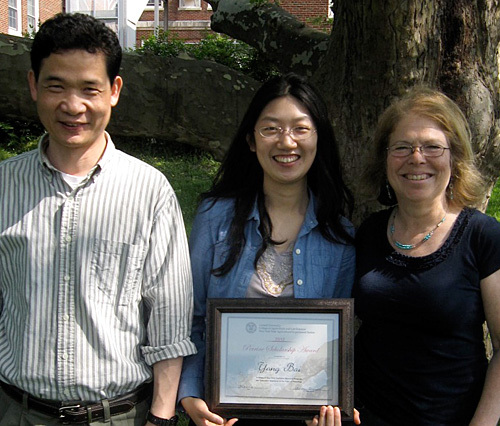 Yang Bai, Ph.D. candidate in the Graduate Field of Horticulture, is the recipient of the 2012 Perrine Award. David Perrine (Pomology ’22), a prominent orchardist from Centralia, Ill., established the award in memory of his wife, Fanny French Perrine. The award supports research by an undergraduate or graduate student in pomology. Bai is investigating apple genomics in Kenong Xu’s lab. 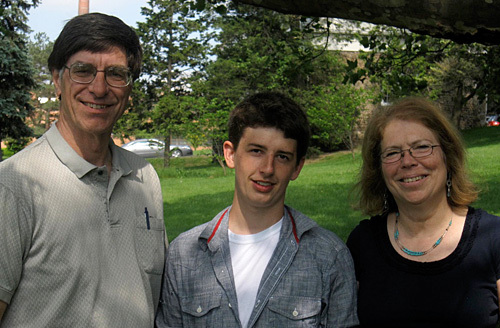 Lucas Hartman, a rising junior with a double major in Applied Economics and Management and Viticulture/Enology, is the recipient of the 2012 Nelson J. Shaulis Fund for the Advancement of Viticulture Summer Research Scholarship Award. The award was established in 1978 to honor then retiring viticulturist Nelson J. Shaulis, who pioneered research in grapevine physiology, integrated management systems, and vineyard mechanization. The goal of the scholarship is to encourage students to enter the field of viticulture as a career by directly working with Cornell grape research and extension faculty. Hartman’s research interests include the effects of genetics on grape physiology.